A Banana Is Not Just A Banana. It is humanity’s oldest story. There’s probably not a single person you know who isn’t familiar with it. The odds, however, are also good that nobody-not you, me, or perhaps even the local pastor has gotten it right. The apple is so prominent in the Western world’s collective imagining of Eden that it came as quite a surprise when I learned that many of the most ancient biblical texts never identified the fruit as such. In its homeland of South Asia, the banana appears in many Buddhist sutras as a symbol of the earth’s generosity, for it grows abundantly and feeds millions. As it spread both eastward to the Arab nations and Africa, and westward to Polynesia, it took on significance in other beliefs. Some Muslim and Christian traditions hold that the forbidden fruit that Adam and Eve so briefly enjoyed in the Garden of Eden was not the apple, which is not native to Mesopotamia, but the banana. A middle eastern Eden could have been hospitable to bananas, and the people living there certainly would have been familiar with the fruit. Even today, the region is a growth center for the fruit, which is farmed in Jordan, Egypt, Oman and Israel. Those same areas are not terribly friendly to the apple, which grows there today in limited quantities and with the assistance of modern agriculture. Bananas are suspected to be the first fruit in the earth by some horticulturists. But, whatever its political and religious history, the banana has long been recognized as a rich food source. Buried in the scientific description of the banana that most often graces our tables, Musa sapientum, one finds a quiet homage to its presumed wonders. The Latin means “muse of the wise person.” Potassium, which the banana contains in abundance, has been likewise called “the salt of the intelligence,” perhaps because it figures in most so-called brain food. Bananas were one of the earliest plants to be cultivated by humans – they were first farmed more than seven thousand years ago – and they remain one of the most important: They are the world’s largest fruit crop and the fourth-largest product grown overall, after wheat, rice and corn. Africans are credited to have given the present name, since the word banana would be derived from the Arab for ‘finger’. They started to be traded internationally by the end of fourteenth century. The development of railroads and technological advances in refrigerated maritime transport subsequently enabled bananas to become the most important world traded fruit. Indeed some people even believe the banana is proof of God’s benevolence. They point out how easy it is to handle and bite; they marvel at its ready-to-use tab for wrapper-removal; they extol its pleasing taste; and they point to its sell-by-date mechanism – its skin turns black. This is celestial confection-making at its best, it is claimed, and shows clear evidence of a deity who created the world for humans. Most would view such ideas as over-the-top, of course. Nevertheless, the banana retains, for all its popularity, an aura of exoticism. And that, at least in part, explains its special economic importance as a symbol of the potency of Western capitalism. ‘Hold our hands and take us to banana land,’ chanted groups of East Germans during the fall of the Berlin Wall, as they rose up in rebellion against the austerity of their communist rulers and begged for capitalist redemption. To them, and many others, the banana – for all its connotations with risqué jokes and pratfalls – meant freedom, at least in terms of middle-class affluence. 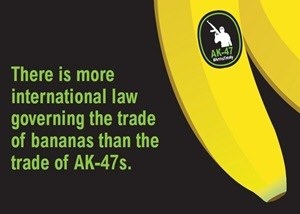 If you have access to bananas, you must have control of world trade and shipping. And if you do, things surely cannot be that bad. Today, we spend more money on bananas than any other supermarket item apart and more than 95 per cent of our households buy them every week. Bananas are us, it seems. Actually, a banana tree isn’t a tree at all; it’s the world’s largest herb. The fruit itself is actually a giant berry. To the American consumer, “banana” seems a simple name for the yellow fruits so abundantly marketed for consumption raw, and “plantain” for the larger, more angular fruits intended for cooking but also edible raw when fully ripe. Americans have only been eating bananas since the 19th century. The first bananas marketed in the United States were brought from Cuba in 1804. For many years they were regarded as a novelty. The first large shipments were brought from Jamaica in the 1870s by Lorenzo Dow Bake, a Cape Cod fishemen who later founded the Boston Fruit Company which became the United Fruit Company. Bananas are different from most other cultivated plants in that almost all the varieties-including the Cavendish-lack seeds (that round, dark center in a banana slice is the vestige of what was once the fruit’s reproductive core). Cultivated bananas never reproduce sexually on their own. All parts of the banana plant have medicinal applications: the flowers in bronchitis and dysentery and on ulcers; cooked flowers are given to diabetics; the astringent plant sap in cases of hysteria, epilepsy, leprosy, fevers, hemorrhages, acute dysentery and diarrhea, and it is applied on hemorrhoids, insect and other stings and bites; young leaves are placed as poultices on burns and other skin afflictions; the astringent ashes of the unripe peel and of the leaves are taken in dysentery and diarrhea and used for treating malignant ulcers; the roots are administered in digestive disorders, dysentery and other ailments; banana seed mucilage is given in cases of catarrh and diarrhea in India. In the traditional medicine of India and the ancient Persia this golden fruit is regarded as nature’s secret of perpetual youth. The banana has everything going for it, so its popularity should not seem that surprising,’ said Lyndsay Morgan of the fruit’s marketing organization, the Banana Group. ‘It is easy to open; it is packed with energy, fiber and vitamins; it is rich in potassium and low in calories. It is also a first-class hangover cure, stabilizes blood pressure and soothes heartburn. On top of all this, bananas contain chemicals that stimulate the production of serotonin and dopamine, the same neurotransmitters set off by Prozac and Ecstasy. In short, bananas are the ultimate food: ambrosia in a colorful skin. We’ve bred these bananas to always be the same, never evolving. Our Cavendish bananas don’t and can’t reproduce on their own, they don’t even have seeds. I’ve been eating bananas my whole life and I’ve never seen a seed. I just took it for granted that they must have seeds somewhere else, or they must naturally reproduce in some other way. It never occurred to me that they were engineered and produced. In fact, today they wouldn’t be able to exist in nature without us. Most bananas exported to Europe are grown on large-scale plantations in Latin America, and increasingly, in Africa. Banana plantations are monocultures – where only one type of crop is grown. 97% of internationally traded bananas come from one single variety, the Cavendish. This lack of genetic variety makes plants highly susceptible to pests, fungi and diseases and therefore large quantities of insecticides and other pesticides are applied to the crops. But, bananas stand in greater peril to disease and insect damage than the majority of other fruits because they are sterile, seedless mutants. New plants are created from cuttings of existing ones, making them little more than clones of one another. Without the natural diversity resulting from sexual reproduction, bananas continue on generation after generation with the same genetic makeup. Their inability to mutate and adapt leaves them vulnerable to species-wide disaster, because what fells one of them will prove the undoing of every plant within that particular variety. Sometimes very strong chemicals are used to combat the various pests that threaten bananas. DBCP, for example, is a powerful pesticide that is used to kill a microscopic worm that would prevent the export of bananas to the United States. Even after DBCP was banned in the United States in 1977 because it was linked to sterility in men at a California chemical plant, companies like Del Monte Fruit, Chiquita Brands and Dole Food continued to use it in 12 developing countries. The Caribbean islands of Guadeloupe and Martinique face a health disaster in which one man in two is likely to get prostrate cancer as a result of long-term exposure to the illegal pesticide Chlordecone . Used to kill weevils, the chemical was outlawed on the island in 1993 but was used illegally until 2002. It remains in the soil for more than a century and contaminates ground water. For plantation workers and local people, the health impacts of extensive agrochemical use are numerous, ranging from depression and respiratory problems to cancer, miscarriages and birth defects. Tens of thousands of workers left sterile by the use of a nematicide, DBCP, in Nicaragua and Costa Rica in the 1970s are still seeking justice in the US courts from the multinationals involved. The final piece of the banana “pricing” equation is genetics. Unlike apple and orange growers, banana importers sell only a single variety of their fruit, the Cavendish. There are more than 1,000 varieties of bananas — most of them in Africa and Asia — but except for an occasional exotic, the Cavendish is the only banana we see in our markets. It is the only kind that is shipped and eaten everywhere from Beijing to Berlin, Moscow to Minneapolis. So is all hope lost? Should we start learning to love plantain-nut bread? Some researchers are not ready to give up. At Queensland University of Technology, professor James Dale is attempting to genetically modify crops to be resistant to the disease. He is planning on planting four acres this spring in order to test his creations. Fernando Aguilar of the Fundación Hondureña de Investigación Agrícola is making the effort to naturally engineer resistant bananas, which requires lots of time, patience and hands on work. “The hybrid plants are like women,” Aguilar told the New Yorker. “To look at a woman from afar is not to know the woman. To know her, you must be with her. And to know the hybrids you must be with the hybrids.” So buck up banana lovers, with dedication like that there is hope yet. This entry was posted in Uncategorized and tagged africa, Banana, Banana Wars, Berlin Wall, Boston Fruit Company, Cape Cod, Carribean, Cavendish, Earth University Foundation, education, enlightenment, environment, food, Garden of Eden, Global, healing, health, human, humanity, india, International Law, life, love, medicine, nature, Plantain, Science, South Asia, The Guardian, United States, Western world, women. Bookmark the permalink. 1 Response to A Banana Is Not Just A Banana. Needed to compose you that very little observation to help give many thanks once again on the wonderful techniques you have shown in this article. This is so surprisingly open-handed with people like you to deliver easily what a lot of folks might have advertised for an ebook to help make some bucks on their own, principally seeing that you could possibly have done it if you ever desired. The inspiring ideas also served like the fantastic way to comprehend other people online have the same eagerness the same as mine to see a whole lot more pertaining to this problem. I’m certain there are thousands of more enjoyable times ahead for individuals who read your blog post.